Dinner sounds most constrained, but delicious. Don’t you think a little, teeny weeny bit of pudding would be OK? But spring is here, or at least knowing that spring is well on the way – saw so many flowers out last weekend including a few daffodils and the birds were singing their hearts out. Dinner looks deliciously healthy, and quite Spring-like, even if it isn’t yet Spring! Maybe just a wee square of dark chocolate for dessert? After all, it’s supposedly very good for you in almost every way! :) Sigh..Zeb has a crush, but will it just be unrequited love from the end of two leashes? When suffering (and even when you’re not suffering) you should be kind to yourself – a little pudding …. that lovely sweet something you look forward to making/baking and, above all savouring and sharing, at the end of your meal is sooooo very good for the soul. Lovely supper- glad you got your small pudding at the end. it is just skipping merrily into all the side roads and taking a VERY long time in getting here! Hi Jo, I think spring might be there tomorrow for a day!!! Hope you get out and enjoy it. I’m out cutting willows on Friday, but I think rain and grey might be back for that! It will come, remember, if winter comes, can spring be far behind, or something! Hey Allison what’s with the willows? Is this a new hobby, basket weaving, hurdles, maintenance? Are you making your own bannetons ;) ? 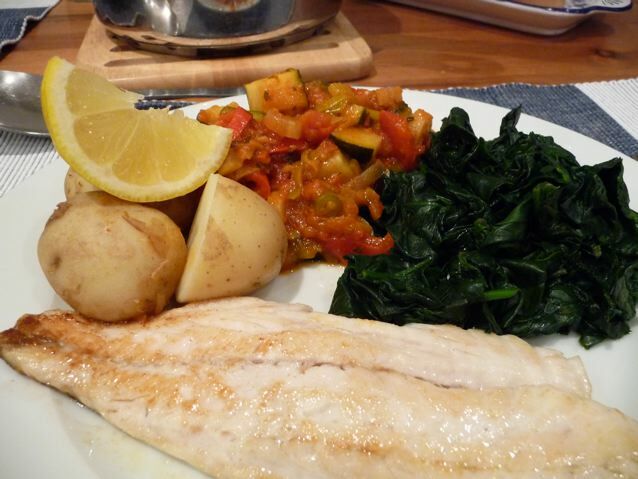 mmm, our kind of dinner :o) Sea bass is lovely but we can’t always get it in the supermarket (or afford it too often!). Fish fingers for dinner instead didn’t quite cut it as an alternative! OK, sorry, but I’ve got to ask about the pudding – what exactly are you folks referring to when you say ‘Pudding’? From context, it sounds like pudding is a collective for dessert – Yes? Over here, pudding can be sweet or savory, but needs lots of eggs to make it custardy. Having said that, I guess we have non-egg puddings too, but they’re always soft and require a spoon. Ask away, I’m always happy to have a quick rant…. Pudding ah pudding…. http://www.foodtimeline.org/foodpuddings.html try this…. apparently it derives from an ancient Roman sausage…. As far as I’m concerned ‘Pudding’ is what regular people call what posh pretentious people call ‘Dessert.’ A pudding is what a working man would have after his tea, dessert is what an upper class lady would have after her supper…. it’s a class thing from the last century in Brit English. But with the Americanization of the English language, ‘dessert’ is now more common and has lost its posh associations for all but oldies like me. So to say ‘pudding’ instead of ‘dessert’ is like saying napkin instead of serviette, or lav (lavatory) instead of toilet, it’s a declaration that you are not a snob and that you identify with the ordinary person on the street, out of date, antiquated but still saying I am no better than anyone else. The old English obsession with class distinction, I don’t think you have that, not after the Boston tea party. It gets more complicated, in that at a certain point in time in the last century, people who aspired to be middle class, from working class origins took up using words like settee for sofa, and serviette for napkin, as sounding French and therefore more cultured and upwardly mobile. Duly mocked and round and round it went…. See this wiki article on U and not U http://en.wikipedia.org/wiki/U_and_non-U_English Nancy Mitford, Estuary English, Class indicators, etc etc mumble mumble….. So I asked Brian, who knows everything, what the difference was between pudding and dessert….